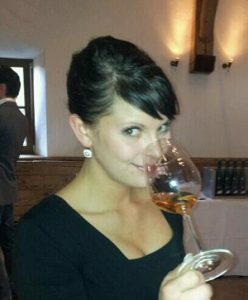 My wine journey started in 2008 when I started working in a Michelin starred restaurant in my hometown of Salzburg, Austria. The variety of international wines on our list, and the associated vinothek where we held many tastings and events, opened my heart and curiosity about the big world of wine. During this time, I started to get to know great Sommeliers and wine enthusiasts. A couple of years later I decided to enroll in my first Sommelier course in Austria and I am currently at the Court of Master Sommeliers in New York. A Sommelier, in my eyes, is an artist who creates combinations and experiments with food and wine pairings. His/her goal is to create a special experience for the guest, with knowledge, passion and the skills of guest needs. The first person I think of admiring especially is Mr. Johannes Einzenberger, a fabulous cheese & wine expert who became my mentor and teacher during my first Sommelier course. I remember very well one of his motto’s: “Follow your dreams, put yourself goals, create a plan, work hard and never forget dreaming!” – I try my best to follow this! Go to wine tastings and events. Meet and exchange yourself with people from the industry. Educate yourself! – Take international courses and exams i.e. Court of Master Sommeliers. Travel! – Go on wine trips and vacations or work in a foreign country for a while. These experiences will benefit you and your further Sommelier career because it will allow you to open your mind and become more confident. There are many opportunities for young Sommeliers worldwide. Determine your personal goals and you will make your way to find an adequate position. Building a relationship with your guest is one of the most important things. Ask about their preferences in grape varieties, wine style, his/her/their favorite wine and the preferred price range. Give two or three options and tell your guest more specific details and explain your choices. My philosophy about glassware, is to have at least four of the standard glasses: standard white wine glass, Bordeaux-, Burgundy-, and dessert wine glasses. I also do prefer to use Riesling- and small Bordeaux glasses in my restaurant. Usually I follow the classic matches, e.g., Pinot Noir in a Burgundy glass. I also like trying to find the best glass for every wine, e.g., a young Sancerre in a standard white wine glass and a matured more complex one in a small Bordeaux glass. The most important thing is that the wine should be the highlight and not the glass. If I had to choose, I personally enjoy working with Riedel glasses and decanters. Pay attention to the preparation of the dish, the sauces and the spices. Experiment and try new pairings. I believe it does totally depends on the restaurant style and concept. Usually you try the wine in high end restaurants before you serve it to your guests. You start creating your wine list based on restaurant’s style, concept, kitchen and location. Try to balance the prices in your list; don’t overprice the wines. Our guests become more and more quickly informed about the wine prices through the World Wide Web. If you keep it as fair as possible, your guest will appreciate it and may even decide on some dessert wine or digestif after dinner. I chat with my Sommelier colleges, go to wine tastings, visit vineyards, and read wine blogs and magazines. When I try a new wine, it gets my attention if it is high quality, impressive or different. As soon as my interest is awakened, I want to get more information about the wine, the vineyard and the winemaker’s philosophy. A very good way for a winemaker to get listed is by taking time to have a personal chat and tasting sessions with the Sommelier. CARMENERE – dark in color, varied in flavors and mysterious in complexity.